Patents that CDC owns for VACCINES -- Conflict of Interest --Biased Towards Profit and NOT Public Health.steemCreated with Sketch. 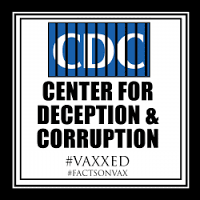 Is it the Centers for Disease Control or The Centers For Deception and Corruption? The CDC is supposed to make unbiased decisions for the good of Public Health. They are the ones who continually add more and more vaccinations to the childhood schedule. 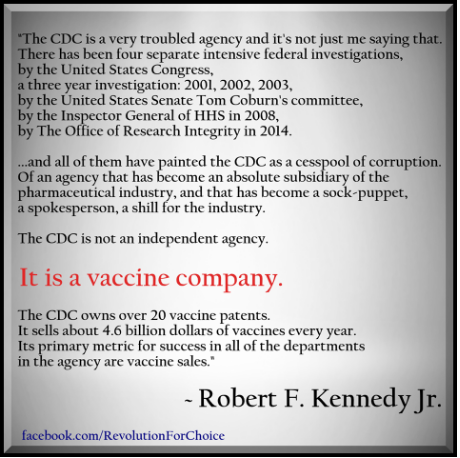 I have written about the CORRUPTION at the CDC several times, including this one by Robert F. Kennedy in which he states that the CDC has over 20 Vaccine Patents! 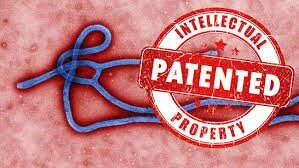 (See Previous Post) CDC is a Vaccine Company, Not an Independent Agency -- revealed by activist Robert F. Kennedy Jr.
Mark Blaxill, an Intellectual Property expert who has been employed by billion dollar corporations to manage their patents, ran a search of the patents held by the CDC. This list validates Robert F. Kennedy Jr.'s claims of "Over 20 Vaccine Patents" owned by the CDC and that they are a Vaccine Company! CDC TRUTH RALLY in Atlanta discovers Leah's Story -- "My Son Died 3 Hours After His Vaccines." Please Comment Below and Let's Have a Productive Conversation! surely we can all be civil and help each other discover the best way forward for all our children and future generations. Thank you Linda @canadian-coconut I went from this post, read your Steemit blog and you've answered a great many of my questions already. Am new to this platform so still familiarizing myself. I run a page on Facebook page called Fully Informed Public. Looking to pull in as many topics/issues facing families today. I truly believe that a misinformed or "dis"informed person is much more dangerous to themselves and others than the uninformed. Censorship is becoming a big problem so am hopeful the platform here will be a bit more stable. I will be inviting people from other groups on FB, email groups etc that are on this same track so will certainly be resteeming and promoting for like minded Steemians. People in the know, as you know, are quite busy, so want to make their experience here on this platform a bit smoother than its been for me so far. LOL Would be nice to get at least one Steemian from each of their groups/organizations and maybe transfer more work groups this way. I'll be recommending new steemians follow @canadian-coconut @familyprotection @markwhittam and will check your Steemit blog and add to the recommendation list here. Apparently Steemit has been running slow for a lot of people familiar with the blockchain platform and am hoping that is addressed soon. Well I must Steem on, there is a great deal to learn. I am sure we will be talking more. and I am really glad that you found Steemit. Yes, hopefully Steemit fixes these glitches soon and things return to normal around here. This is a very great post. Great job linking them all to the google patents page too. People can't really argue against this information! CDC is definitely super biased, corrupt, and definitely an arm for the pharmaceutical company to deceive people into believing their medications and vaccines are safe and effective. The CDC and FDA are both cesspools of corruption. The board members also sit on the boards of major pharmaceutical companies...no conflict of interest here!!! Those vaccines are so toxic, I wouldn't use them to get rid of rats- it would be too cruel! Great post upvoted! Thanks for commenting here. I agree. These people should not be trusted with our health and especially our children's health. Well done for writing about this issue. It's exhausting arguing with people entirely 'taken in' by the vaccine lobby. Good thing I can bypass all of these, without vaccines. When do their patents expire? Patents usually only last a maximum of 20 years. 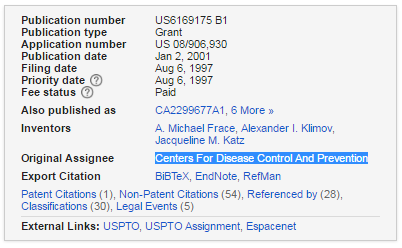 Each patent shows the date it was granted. For example, the first one listed here is May 2000. I'm not sure about expiry dates though. Because it is older than 7 days old.